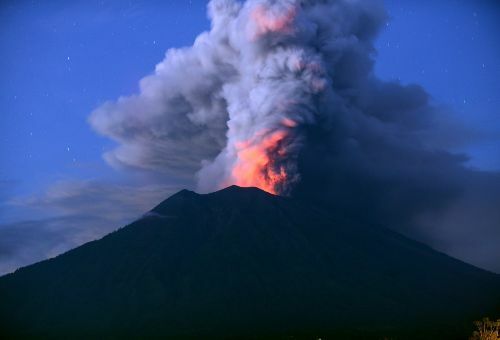 An erupting volcano with a deadly history on Indonesia’s island of Bali has spread drifting ash nearly five miles into the atmosphere and forced the island’s international airport to close two days this week. Authorities have told 100,000 people to leave an area extending six miles from Mount Agung as it belches gray and white ash plumes. The volcano’s last major eruption in 1963 killed about 1,100 people. It’s unclear how bad the current eruption will get or how long it will last. Nearly 40,000 people are staying in 225 shelters, according to the Disaster Mitigation Agency in Karangasem. But tens of thousands of villagers have remained in their homes because they feel safe or don’t want to abandon their farms. Flows of volcanic mud have been spotted on Agung’s slopes, and more are possible because it’s the rainy season, said Richard Arculus, a volcano expert at Australian National University.